December 3rd was an unforgettable day for GINA’s Team and, thankfully, I was there to share it. It was very soon after surgery, but the doctor said it would be good for me to go and she was absolutely right. 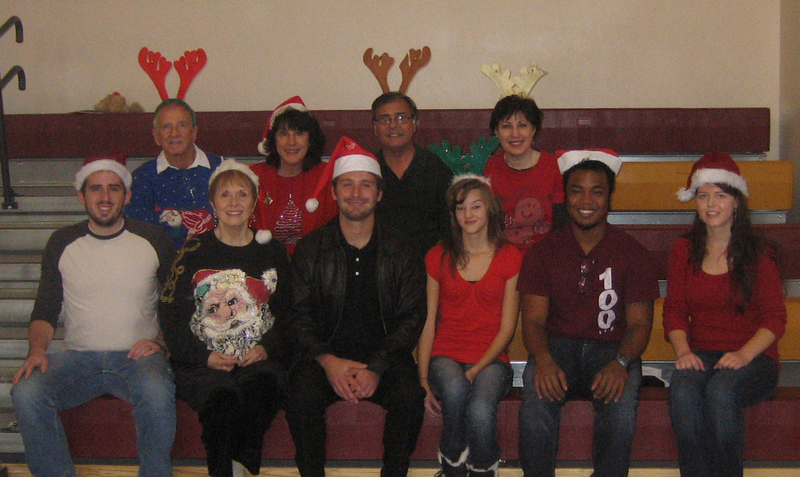 It was the day of our Christmas program at Mingus Mountain Academy. Gina’s Aunt Linda works for State Farm Insurance and sent out an email request to all the employees. Would you be willing to donate one stuffed animal to the girls at Mingus? We need 110. A resounding YES was heard and a parade of animals started marching. Soon her bedroom was a stuffed zoo and she had made more than her quota. At the same time, we’d been working on the library for Mingus. This was the day to bring the first of the books up to the school. I want to send a special thanks to Tyson Adams and Leah Heathcoat from GINA’s Team. Tyson headed up the book drive and drive is the right word. This young man spent hours driving around collecting books from all of you who so generously donated. Leah acted as back up and found storage for so many books thanks to the generosity of the Grigio Tempe Town Lakes. Finally, we teamed up with Coleen Fitzpatrick and the amazing group from The Raven Organic Café in Prescott. Coleen put out the word and the Raven became the drop off point for book donations there. Then she got her friend Geraldine Thomas, owner of Grama’s Bakery, to donate an enormous amount of delicious cookies for the girls. We definitely felt like Santa’s elves. The program started with carols. After the carols, the room grew silent. Gina’s daughter, Mariah, had joined us for the day and agreed to speak to the girls. Just 15, Mariah is the age Gina was when she started on her journey, and the age of many of the girls at Mingus. Mariah spoke passionately about how Gina’s decisions have affected her life and the lives of her brothers and sister. Her simple honesty touched their hearts. This is our purpose, to help girls realize that they have the power to change the direction of their lives and make new decisions, decisions that can keep them safe, out of prison, and on a new path. We are so proud of Mariah, her leadership abilities and her straight A’s in school. She is definitely on the right path. We then showed them the mountain of books. Can we have them now, now, now??? No, unfortunately, they have to be catalogued, but soon, soon, soon. Their excitement was contagious. We know more books are coming, the mountain will grow and lives will be impacted. Books are powerful. Finally, we started the distribution of the animals, worked out by a very scientific numbering system designed by Aunt Linda and Gina’s mom, Diane. There were so many, all different. What if you got a bunny and you wanted a bear? 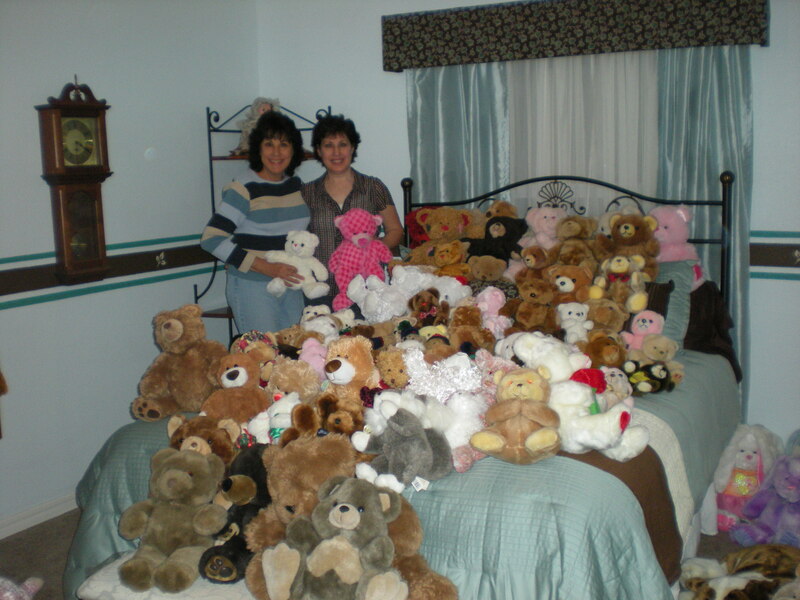 Linda and Diane had figured that out too and at the end, there was even a swap so everyone left with just the right new stuffed friend. Remember in high school when you had to find a place on your bed to sleep with all the animals piled up? Remember the ones that were particularly special, even when you were all grown up? When you felt completely alone, with no one to trust, that stuffed bear or bunny or puppy was your best friend. I told the interns I thought that one sentence was powerful enough to write an entire master’s thesis. The social, economic, cultural and racial implications are enormous. And imagine there are only 110 girls at Mingus. There are thousands, millions of girls (and boys) around the world without that one stuffed friend. Christmas is over, but if you have a collection of stuffed animals you’ve been wondering what to do with, there are places all over the country that will be glad to give those animals a new and beloved home. If you aren’t sure, let me know. I’ll find a place, no matter where you are. The need doesn’t stop in December and that gift just might change a life. You never know. If you have a story about your favorite stuffed friend, I’d love to hear it. I have a new favorite. At Mingus, Gina’s family gave me an early Christmas gift. They gave me Molly, a darling stuffed Cocker Spaniel who was Gina’s favorite. Molly now has a place of honor in our home and my heart. I live in gratitude. I have just come out the other side of the rabbit hole. In September, 2002, I had a mastectomy. If you’ve read my book, you know it was a horrific experience that I equate to being alone in the deepest, darkest hole. On November 23, 2010, I had a second, preventative mastectomy and I equate this experience to being in a sun filled meadow of flowers and sweet breezes, with family and friends surrounding me. The first surgery was performed while I was an inmate in our local jail. The second was performed at the Virginia Piper Center in Scottsdale, Arizona. I have come full circle. It’s only been two weeks and I admit I don’t feel fantastic, but I know it is a miracle that I am alive. There were so many things the jail denied for my healing and comfort. This time, I was stunned with the attention and details to make sure I was cared for in every way so the healing would begin immediately. I won’t go into the past experience. I just want to celebrate this one. David was with me. Gina’s mother was there as well as other precious friends. The doctors and nurses were compassionate and caring. I live in gratitude for coming full circle from the darkness into the light. The pathology report was perfect and I know I will live a long and healthy life, dedicated to GINA’s Team. I would like to write more about this, but I seem to be experiencing anesthesia brain. My fingers and my brain are not working together very smoothly. I just want to thank all of you for your your prayers and messages of love and light. There are not enough words to express my gratitude.